In 1975, Andy Warhol peered into the future and saw . . . Damien Hirst? ‘Business Art is the step that comes after Art,' Warhol wrote in The Philosophy of Andy Warhol. Not only was it OK for artists to make as much money as possible, but ‘making money is art' and ‘good business is the best art.' At the time Warhol was the master of Business Art—he established Andy Warhol Enterprises in 1957, and films, Interview magazine, books and TV programmes were to follow—but his operation was small beer by contemporary standards. Today, artists like Hirst set the bar for ‘good business'. On 15 and 16 September he bypassed his two major dealers (White Cube and Gagosian) and auctioned 223 pieces of new work directly at Sotheby's. The sale beat its already sky-high estimates by a substantial margin, bringing a total of £111.5 million, ten times the old record for a single-artist auction, set by Picasso with 88 works in 1993. During those same two days Wall Street melted down. (Hal Foster, "The Medium is the Market", in The London Review of Books, Vol. 30, No. 19, 9 October 2008, p. 23). The British funeral-services industry faced a backlog of hundreds of corpses as undertakers, unable to obtain credit, refused to perform burials for the poor until the government guarantees reimbursements. (Paul Ford, "Weekly Review", Harper's, 14 October 2008). 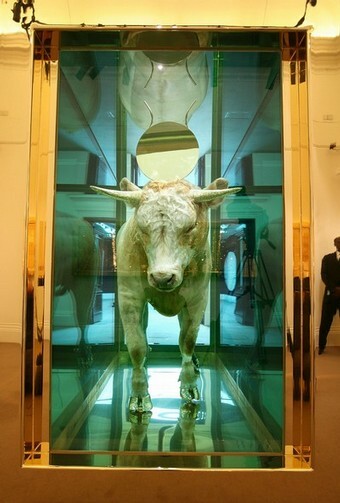 Damien Hirst, The Golden Calf. (White bullock in formaldehyde, hooves and horns cast in solid 18-carat gold, sold at auction for £10.3 million on 16 September 2008).